So that’s that! S193 done and dusted. I’ve submitted my end of course online assessment and now await the result! I’m quietly confident of a comfortable pass, though I should never underestimate my ability to fall into the clever little traps the OU like to set for you! After doing the first 10 questions early and then going back over them towards the end, I did manage to spot one little mistake of mine, but hopefully there won’t be too many others – we’ll see! As the Open University’s short, 10 point science courses don’t require any written assignments like the epic S104 foundation course, I thought it would be a good idea for me to summarise the course content here in ‘Holey Schist’. This will help consolidate my knowledge and maybe with a little help from you lot out there, help spot some glaring misconceptions that I may have picked up along the way? So here goes . . .
Firstly, let’s answer the obvious question: what is a fossil? Well, to quote the S193 course book, “a fossil is simply any evidence of ancient life, naturally preserved within the materials that make up the earth”. Such ‘materials’ are invariably rocks, formed from mud, silt and volcanic ash, but can also include other substances like natural resins (producing for example amber) and even ice. Prior to doing this course I did wonder what the dividing line was between ‘dead animal’ and ‘fossil’ and the truth is that there is no strict dividing line between the two. Generally speaking though, palaeontologists would only really consider remains over 10,000 years old to be fossils. The development of life on earth through time is recorded in successive layers of sedimentary rock – their strata. As time passed, the deposition on sediments layer upon layer effectively form ‘pages’ of the earth’s history ‘book’ and present evidence of environmental conditions at the time of deposition and a sample of life around at that time in the form of fossils. Unfortunately, things are complicated by the fact that many pages of the ‘book’ are often missing. Periods of time when deposition didn’t occur in an area thus creates a time gap. Similarly, when layers are eroded, evidence of the time that that particular eroded rock was deposited is lost. When new deposition occurs on top, the gap in time created between the resulting strata is called an unconformity. The study of strata and their relationships in time and space goes by the name of stratigraphy. Studying successive sequences of strata and their fossil content has enabled geologists to firstly place events in a geological perspective by dating strata relative to each other. That is, Rock ‘A’ is above Rock ‘B’ and is therefore younger. The arrival of radiometric dating enabled geologists to establish ‘absolute’ dates to rocks, subject to certain levels of uncertainty e.g. +/- 3 million years. Prior to this, dating was, with the benefit of hindsight, wildly inaccurate, but one must also bear in mind that new discoveries and advances in scientific techniques could easily spark a hasty redraft of the currently accepted stratigraphic column. The British Geological Survey website has an excellent example of the latest Stratigraphic columm. Take a look here. For all of you who share my somewhat misguided ambition to be dug up ‘x’ million years from now as a beautifully preserved fossil by a future earth creature/alien visitor, just what does one have to do to become a fossil? Well, alas, it ain’t that easy! For instance, when we look at the fossil record it is important to realise that it only represents a tiny fraction of the likely total population of past life and that record is heavily biased towards creatures that lived in shallow marine environments. The reason for that is simply due to the fact that such environments provide the best conditions for preservation to take place. As well as environmental conditions, other factors have a bearing on an organism’s ‘preservation potential’. For example, whether it has any ‘hard parts’, whether and how quickly it becomes buried in sediment and whether that sediment ultimately becomes a part of the rock record. So, if I am aiming for the best possible chance of preservation I will need to aim to be buried in suitably fine grained, oxygen starved sediment, either in a shallow marine or lake/river environment. Alternatively, I could aim for entombment in sticky tree resin as per insect fossils in Amber. Somehow this latter option doesn’t appeal quite so much – don’t ask me why!?! It might seem odd that seemingly hard, solid substances like shell and bone can be converted into rock, but both contain miniscule pore spaces which can in the right situation, become filled with mineral rich water. In time the minerals may crystallise out thus filling the pore spaces with those minerals. This process is called ‘permineralisation’. Additionally, original bone can be replaced by minerals completely in a process called (rather unimaginatively) ‘replacement’. Together, these two processes are called ‘petrifaction’, but neither of these processes have to occur for remains of an organism to be termed a fossil. Some fossils can indeed be composed of barely altered bone or shell! In Part 2 we’ll look at the way that fossils are named and classified and how palaeontology fits in with evolution’. Any comments? Feel free to contribute! And a slightly belated 'Happy New Year' to one and all! So that was it - 2009! What a year that was!?! Some good, some bad and definitely, some downright UGLY! So here goes. Brace yourself - it's The Holey Schist Review of 2009 from my own personal vantage point! January:- Okay, so 2009 got off to an optimistic start with Ruth being offered a job at Nottingham Trent Uni opening the way for our longed for relocation to the East Midlands! Then I received an unconditional offer of a place at Leicester Uni to study Geology! Exciting times ahead . . .
February:- Ruth and Amy move to Loughborough in readiness for their starts at NTU and Robert Bakewell Primary School respectively! Both settle in really well, but boy is it tough being separated from me and Anna back in Bolton. What sounded a straight forward idea in principle wasn't to prove as easy as all that! March:- Meanwhile, my Open University course - S104 starts to get tougher, more so when weekend study time is swallowed up by trips to Loughborough in order to reunite the family! April:- Quantum Physics! The subject that I feared most in S104 turns out to be my greatest triumph! It just showed that with grit and determination great things can be achieved! 90-odd percent? Extraordinary! The 'End of Course Assessment beckons! May:- My 49th Birthday arrives and gifts of money were used to purchase several books of a geology persuasion, including Wayne Ranney's 'Ancient Landscapes of the Colorado Plateau' - definitely my 'Book of the Year - 2009'. Simply, a GEM! June:- After Anna completes her GCSEs we both move down to Loughborough to be reunited with Ruth and Amy! Hoorah! Meanwhile, S104 Exploring Science is finished, done and dusted. Just a 2 month wait for the result! Left my job with Jacobs and endured possibly the most farcical and stressful job change of my life! July:- Had offer on the house in Bolton! Hoorah! Buyer later pulls out! Boo! Meanwhile, now working for Balfour Beatty - kind of, err sort of jumped ship as it were!?! Don't ask!!! August:- Passed S104 with 'flying colours' (whatever that means!?!). Just 8 tantalising percent short of a distinction! Getting that close was something of a miracle in itself, given the mega-stressful year we've all had! Anna also got her GCSE results - umpteen passes as expected! We're VERY proud of her!!! September:- Can't remember much happening in September other than too much work and stress, Work proving to be fun though - actually involved in building a road - 28 kilometres of it to be precise. Okay, it means turning green fields into tarmac and concrete, but it wil actually improve peoples lives in the long run and help stop lots from getting killed! Yes, really! October:- Enrolled on S193 - Fossils and the History of life with the OU. Starts in December and is just a short 2 month, 10 pointer. Should be very interesting! Went to sister-in-law Caroline and Charlie's Wedding in Sileby, Leicestershire. Fantastic day! Lovely couple! Got a tad drunk, myself! Caroline, Charles and his parents. My gorgeous wife Ruth, with me looking rather like Mr Fezziwigg from Scrooge. I mean me, not Ruth! Amy Claire and Anna-Ruth looking beautiful! November:- NOT a good month! Ruth not well. Details are rather personal, but suffice to say, our 'work/life balance' is a bloody mess and needs addressing as soon as poss! The sooner that damned house is sold in Bolton the better!!! On a positive note, both the girls took to the stage, with Anna singing in a choir called 'Enchanted' while Amy made her first public perfomance with 'Stagecoach'. Step-dad (yours truly) blubbed through every performance! Bless! December:- Christmas comes and with it snow and weather, the like of which I aint seen for decades! The fossil course is now underway and fascinating it all is! 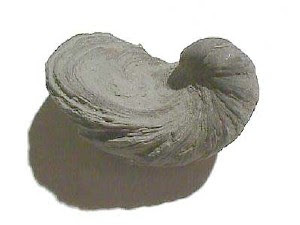 Above: Gryphaea arcurata, also known as 'Devils toenail' a fossil from the Triassic/Jurassic. (Source: Wikipedia - 2009). Regular reference to the 'Geological Timescale' means that it is at long last sinking in! Had a great Christmas break well and truly recharged the batteries in readiness for the NEW YEAR!!! So there you have it. A 'funny old year' and not one I'll look back on with much pleasure in truth. BUT, at least the family has relocated to Loughborough at last and there's so much to be positive about as we get stuck into 2010. I fully intend to blog a bit more this year and I'll start with a review on S193 once I finish it off in a couple of weeks time. As there are no written assignments required on this one, I think it would be a good idea to summarise the whole thing in a series of blogs right here! So Happy New Year and stay tuned for some palaeontology! Nice!